"The decision to pick on a date that favours freshness over ripeness, and the restrained oak handling (just 20% new) have paid off completely. This is elegant and beautifully rustic at the same time." "Winemaking, for us, is a natural extension of farming. We explore classical expressions of different grape varieties, some well-known like Chardonnay or Cabernet Sauvignon, and some rare like Ribolla Gialla or Refosco. In all cases we try to respect the purity of the variety and the individuality of the site. Our wines are refreshing, complement food, and are moderate in alcohol." Winemaker Steve Matthiasson dreamt of farming his entire life. He became an obsessed gardener and cook while studying philosophy in college. In 1994, while back in grad school for horticulture after three years as a bike messenger/wannabe farmer, he found a job in vineyards and orchards working for a small sustainable agriculture consulting firm. In 1999 he co-authored the California manual on sustainable vineyard practices. In 2002 he started consulting on vineyard practices in Napa. He still loves the challenge of solving vineyard problems for others, but since 2003 the primary focus has been on our own family farming and winemaking. Steve is a life-long student of the craft of viticulture. Jill Klein Matthiasson always felt that the intersection of nature and culture was the most important thing. She studied botany at Penn, researched ancient farming techniques in Israel, and studied traditional methods for soil health in grad school at UC Davis. She pioneered “farmer to farmer” networking for sustainability in the early 90s while working for a family farming non-profit, and ran programs training farmers on direct sales, such as CSAs and farmers markets, before local food had the momentum that it has now. As the family grew, that passion translated into more local action, like teaching cooking from the garden classes in the local grade school, and serving on the Napa Farmer’s Market board. She runs the business side of the family farming and wine business. Steve and Jill's story featured in the popular SOMM: Into the Bottle documentary in 2015, profiling the devastating loss of a huge proportion of the 2013 vintage due to earthquake. Their wines are frequently described as some of the most elegant and balanced being produced in California, with surprisingly low alcohol and moderation of oak influence, and always represent particularly good value for money. In 2014 the San Francisco Chronicle named Steve winemaker of the year, Steve and Jill appeared on the cover of Wine Enthusiast magazine in June 2017, and also in 2017 they were finalists for the prestigious James Beard award. They are considered by many critics to have paved the way for small-production in California, a wine region that was up until 2003 dominated exclusively by big names and Bordeaux-like grand chateaux. 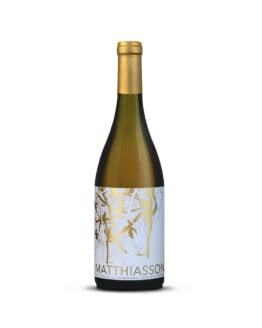 Matthiasson was ranked second on The Week's October 2017 list of six best new wineries in America, with Steve and Jill described as having "parlayed their backgrounds in agriculture into some of California's most exciting new bottles". Steve's philosophy towards winemaking, favouring a small-scale organic and agricultural approach, was described in the Connoisseur's Guide to Californian Wine as being "held up by some as the model for the right way to grow and make wine in a time where so many folks are doing it wrong".